Desperation is horror novel written by Stephen King, on people which get abducted by possessed police officer in fictional town Desperation. 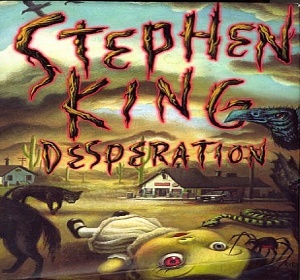 Desperation was published simultaneously with the novel The Regulators (written by King under the name Richard Bachman). The two books share similar characters but with different ages. Desperation offers everything what required for good horror story: snakes, scorpions, spiders, rats the size of cats, hostile serpents and demons. The book has some extremely creepy moments and the size of this Steven Kings 600+ page novel is only problem with it. It takes too much time to come to adventure as King is going in far too many details, pacing and muting real action. anonymous: "Steven Kings Desperation review"
Solve this complex math: 10 + 10 = ?